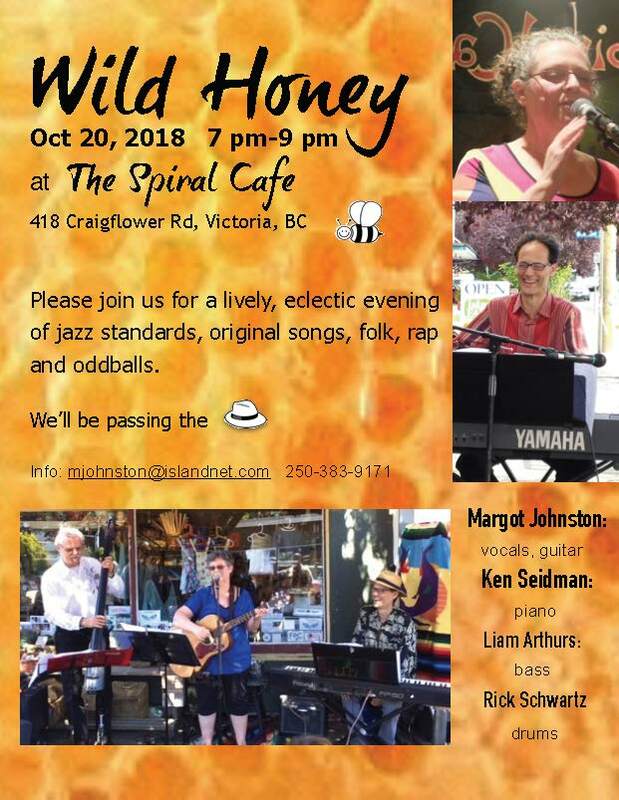 Wild Honey will be performing October 20, 2018 from 7 pm to 9 pm at the Spiral Cafe (418 Craigflower Road). Come join Margot Johnston (vocals, guitar), Ken Siedman (piano), Liam Arthurs (bass), Rick Schwartz (drums) for a lively, eclectic evening of jazz standards, original songs, folk rap, a wee bit of country (for that yodelling factor) and oddballs. Margot Johnston will be presenting a number of her own songs in a variety of different genres. This entry was posted in Margot Johnston. Bookmark the permalink.